I am reporting only a few hundred meters away from where Australia’s first greyhound race took place at what was then called Epping in New South Wales. It was a day all of us wish had never happened. But it did, and this started 90 years of cruelty to greyhounds in Australia as the industry soon expanded and currently operates 67 tracks in all states and territories. Happily, this week marks a massive change of fortune for the greys. With the New South Wales Parliament passing legislation to close all of its 34 tracks by July 1 2017, half of this country’s operating facilities will be shuttered and thousands of greyhounds will be spared from injury, abuse and death each year going forward. Let’s briefly put this into perspective. There are just eight jurisdictions in the world with a commercial dog racing industry and five of these combined have fewer tracks than the number of tracks that will be closing in NSW (USA, Macau, Mexico, New Zealand and Vietnam). The whole of the UK has 35 tracks. These numbers show how big this week’s victory is! Wednesday’s decision by the NSW Parliament to stop dog racing has redefined the future for greyhounds in Australia. This decision is an absolute turning point in both our Australian and global fight to end this atrocious industry. The Australian Capital Territory (the ACT) has already announced that the industry has no future. Suffering and dying dogs are a fixed part of racing and only ending racing will stop the suffering. 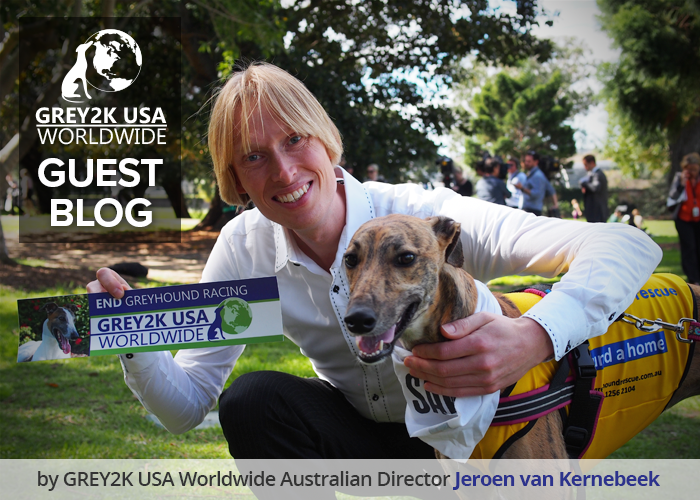 GREY2K USA Worldwide works with partners in all eight countries where a commercial greyhound racing industry still exists to phase out this cruelty. We are knocking down the last remaining states in the US one by one. It is also likely that racing in Macau will end soon due to our joint campaign with ANIMA, Animals Asia and Animals Australia. And in both the UK and Ireland the industry has come under intense fire for its failure to take the welfare of dogs seriously. The times are with us because collectively we have alerted our communities to the plight of these animals and we have inspired action to speak up against what is so obviously and inherently wrong. The days of greyhound exploitation for a bet and a profit are numbered. Our societies simply don’t tolerate it anymore. 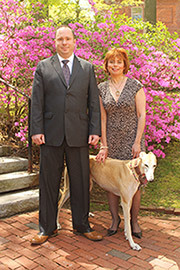 On behalf of GREY2K USA Worldwide, I thank all of you for fighting on the greyhounds’ side. Let’s celebrate this moment together with our rescued greyhounds. We look forward to continue to work with you to give greyhounds around the world the wonderful and safe future they so much deserve. Down the road from where I live, in the opposite direction of where the Epping track used to be, is Australia’s best known greyhound race track, Wentworth Park. On race nights, I can hear the lure go around and sometimes the dogs barking in the kennels. It is a frequent reminder of the greyhounds’ misery and why we are fighting this fight. We are incredibly relieved that these noises will soon be a thing of the past. But our fight will continue to free all greyhounds around the globe from cruelty. Your donation will help the animals so much. My husband and I have been marching and have signed every petition possible to stop this cruel industry. We will continue to fight for the dogs in the remaining states of Australia. It is truly amazing what people power can do.